Smart Gas Metering Systems Market size for 2016 was over USD 1 billion and is set to surpass an annual installation of over 110 million units by 2024. Growing measures toward energy conservation coupled with increasing fuel prices will boost the smart gas metering systems market. The incessant need for billing accuracy & enhanced customer service has further instigated a favourable business scenario toward the adoption of these systems. For instance, the Smart Metering Implementation Programme (SMIP) initiated by the government of UK aims at replacement of 53 million gas and electricity meters in over 30 million residential premises by the year 2020. The deployment programme endeavours at efficient optimization of energy and restructuring of energy supply system. Stringent government norms toward energy management coupled with mandatory nationwide rollout programmes pertaining to environmental sustainability will propel the smart gas metering systems market. Government legislations mandating the adoption of smart meters as a part of comprehensive energy conservation initiatives will further provide a stimulus to the industry growth. As per the EU Gas Directive issued in 2013, the government mandated rollouts in countries including the UK, Ireland, Netherlands and Italy with a target of installing over 50 million smart gas meters by the year 2020. The rising need to eliminate losses during distribution of gas along with need to reduce the operational expenditure of conventional metering systems will drive the smart gas metering systems market. Increasing investments toward smart grid infrastructure coupled with ongoing expansion of gas pipelines network will further augment the business growth. Commercial segment for 2016, accounted for over 30% of global smart gas metering systems market share. Increasing consumer focus toward energy savings during peak hours will positively influence the industry outlook. Installation of advanced meters to reduce energy bills and effectively map fuel consumption will further fuel the product demand. 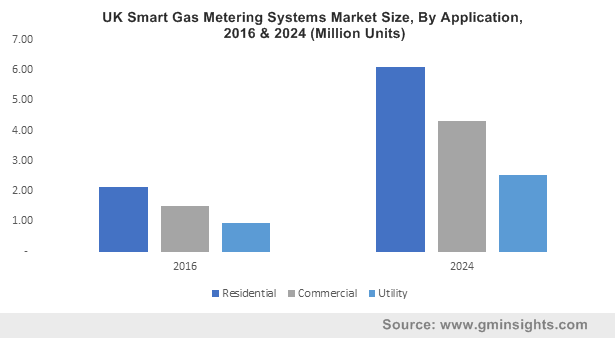 Introduction of nationwide rollout plans and directives toward replacement of conventional meters across residential will positively impact the smart gas metering systems market size. Shifting focus toward construction of smart homes with positive outlook toward management of energy usage will further facilitate the product adoption. Automated Meter Reading (AMR) smart gas metering systems market will witness strong market share on account of their high adoption with regard to affordable prices. 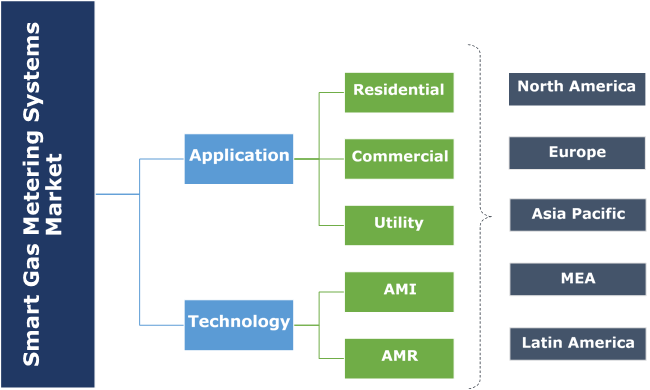 AMR is a conventional technology that facilitates one-way communication by collecting energy consumption and transferring the data from end consumer to the utility. Smart gas metering systems market share from Advanced Metering Infrastructure (AMI) is set to witness growth over 20% by 2024. AMI technology allows utilities to enhance their customer relationship and actively engages the customers in their consumption decisions with real-time access to the usage information. Shifting focus to AMI technology as a part of the smart grid initiative will further propel the product demand. Europe smart gas metering systems market is set to witness substantial growth owing to the government directives and mandated rollout programs across various countries. Increasing measures toward optimization of operational efficiencies of gas utilities and access to billing records will positively influence the business outlook. For instance, in April 2017, the French government approved the launch of the largest rollout programme of smart meters, which involved the replacement of 11 million smart meters in a duration of five years. Increasing energy prices and consequent growing consumer interest toward billing transparency & accuracy will stimulate the U.S. smart gas metering systems market. Low emission levels and cost-effective prices are some of the imperative parameters that will stimulate the adoption of these meters across the utility and commercial sectors. China smart gas metering systems market will witness growth of over 25% by 2024. The introduction of favourable government initiatives along with growing consumer inclination toward intelligent metering systems will fuel the industry growth. For instance, in 2015, the National Development and Reform Commission (NDRC) of China introduced ladder pricing and time-of-use price structure for users across the residential, commercial and utility sectors. Rapid urbanization and increasing concerns for theft protection will stimulate the MEA smart gas metering systems market. An array of projects and initiatives undertaken by government authorities for facilitating the deployment of intelligent systems will further propel the industry growth. For instance, in 2016, Qatar successfully executed the first phase of deployment of smart meters along with the target to reach 16.1 million units across the Middle East by 2022. Eminent industry players in the smart gas metering systems market include Honeywell International, Badger Meter, Siemens, Itron, Osaki, Landis+Gyr, Aclara Technologies, Sensus, Raychem, Apator, Schneider and Diehl Metering among others. Strengthening voluntary industry initiatives by several global manufacturers are also compelling national governments to establish minimum operational requirements and introduce incentives for the adoption of advanced metering solutions. Smart gas meters work with an integrated smart energy monitor to provide operational flexibility and effectively track the consumption and associated costs. These meters can feasibly track and modulate the consumption of gas and are designed to calculate the overall consumption and supply costs to ensure cost benefits and curb the wastage of energy.